While planning is still underway for evolving the site (and it still is even in 2017! ), we’ll use this page to show you what product we’ve got in stock for you right now! It’s as simple as dropping us an email and we’ll get right back to you to confirm your order. Updated regularly as new stock comes and goes! If you don’t see something you want, just hit us up with an e-mail and we’ll get that sorted for you. Note: if you require shipping, this will need to be quoted in addition to the prices listed. CURRENT SIZE COMIC BAGS – ah yes, the little bags that amuse those who don’t ‘get’ comics. But we know its nice to keep our comics nice. These are archival quality bags, which come in packs of 100 bags. These typically fits comics from 1970’s onwards. Other sizes (Silver Age, Golden Age, Magazine, Roleplaying) are available on request. $18.00per pack. or for $21 you can get the resealable bags (recommended. Avengers vs X-Men #0 – 12 The complete run of this series is now available having just wrapped up. The first few sold out and gone into repeat printings. These are all first prints. This series sets up the new Marvel Now! era $10.25 each. BATTLECHASERS #2,4-6 (Variant cover for #6 shown) – Battlechasers, a much maligned series due to it’s errcactic publishing history but all the same a series endeared to many readers of late nineties. In stock are three issues. #4 is the ‘Robot’ cover. #2, 4 and 5 $8 each. #6 $12. More Steampunk/Fantasy fun! price. The set of 14 issues, only $90. Batman: Arkham Asylum Series 1 Wave 1 Figure Set $180 (new lower price!) – Batman, Joker w/Scarface, Harley Quin, Scarecrow, all mint on card. These are simply beautiful works in plastic. Harley never looked so good! 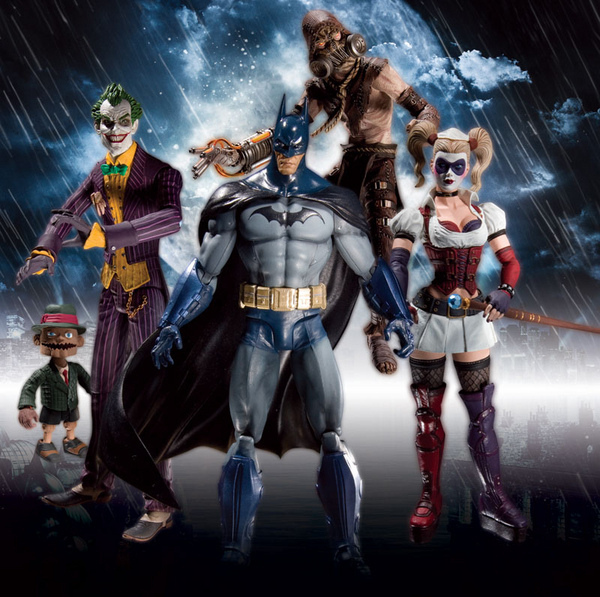 Orders being taken now for Batman Arkham City Wave 2 figures (Catwoman, Hush, Riddler, Mad Hatter, Detective Mode Batman). I was looking for some of those golden age Star Wars comics, any of those? By golden age do you mean the Marvel 70s/80s era of Star Wars comics? No single issues (prices are climbing thanks to Marvel’s success with reclaiming the licence and doing the new series) Lot’s of good cheaper options those to pick those up in collected editions. Happy to recommend some if they’re of interest.